A type of pasta that is made with whole-wheat flour instead of the commonly used semolina, which is hard-wheat flour. Whole-wheat flour produces pasta that is darker in color with a high nutritional value, containing protein and fiber. 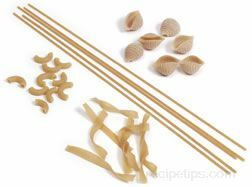 The flavor of the whole wheat gives this pasta a distinctive wheat taste (stronger flavor) and a chewier texture than pasta made with semolina. Combined with ingredients that are stronger flavored, such as garlic and pesto, whole wheat pasta provides a healthier substitute for many of the common pastas.